The ongoing crackdown against criminals in Karachi has significantly restored peace in the Baloch-populated neighbourhoods of the city, but Baloch nationalist parties are still reluctant to field their candidates there in the upcoming local government polls over security concerns. The two key Baloch nationalist parties that actively participate in parliamentary politics are the National Party (NP), the ruling party in Balochistan, and the Balochistan National Party (BNP), the major opposition party in the province led by Sardar Akhtar Mengal. Baloch activists and researchers say that over 2.5 million Baloch live in Karachi, especially in Lyari and Malir, but the two nationalist parties have largely ignored the city. Hanif Dilmurad, a Karachi-based researcher, said Baloch are one of the indigenous communities living in the city’s suburban and central parts including Lyari, Malir, Sharafi, Gadap, Mauripur, Orangi Town, Jamshed Road and Manghopir. In the 1960s, Karachi’s Baloch community was heavily involved in left-oriented nationalist politics and had elected prominent nationalist figure Mir Ghous Baksh Bizenjo in Lyari. The city’s Baloch neighbourhoods served as strongholds of the Pakistan National Party and the then National Awami Party. In 1967, the city’s Baloch students had formed the Baloch Students Organisation (BSO) during a three-day convention after merging its organisation, the Baloch Students Educational Organisation that was found in 1962, with the Quetta-based Warna Waninda Gal (Youth Educational Forum). However, since the emergence of the Pakistan People’s Party in the 1970 polls, the Baloch nationalist parties have lost their support in the city. Although Karachi lies in close proximity with Balochistan, especially its Markan region, a traditional stronghold of nationalist politics and separatist movements, analysts say that the city’s Baloch community, unlike other ethnic groups including Mohajirs, Sindhis and Pashtuns, have neither formed an ethnic party of their own in recent years, nor supported the NP and the BNP. Baloch activists say the community is frustrated with the PPP because of the law and order problems in Karachi’s Baloch-populated areas, particularly in Lyari, and this has provided a good opportunity to nationalist parties to organise themselves at the grass-roots level for the local government polls. Shafi Baloch, a veteran political activist in Lyari, is annoyed with the PPP as he believes that party only uses Karachi’s Baloch community for its own political interests. “The PPP uses us for dancing to the song ‘Dila teer bija’ at their rallies and voting their candidates into power. But in return, the Baloch-populated areas are not even given basic facilities including clean drinking water, education, healthcare, and most importantly, peace,” he said. The community is also critical of Baloch nationalist parties for not showing interest in owning the Baloch of Karachi. “When you go to Quetta and Gwadar to meet the leaders of nationalist parties and ask them for employment for their children, they snub us by saying that we are Karachi’s Baloch,” said Shafi. Shafri added that criminal gangs too have successfully exploited the ethnic nature of violence in the city and tried turning into a ‘Baloch party’ under the name of the People’s Aman Committee. Analysts say the ongoing operation against criminal syndicates in Karachi and the upcoming local government polls have provided an opportunity to fill the vacuum of an alternative political force for the city’s Baloch community. Dilmurad said the Baloch community was becoming disgruntled with the PPP and supporting independent Baloch political figures including Abdul Hakeem Baloch, Saleem Kalami and other candidates in the local government polls. “It is high time for nationalist parties to organise the party at the grass-roots level in the city by participating in the local government polls,” he added. 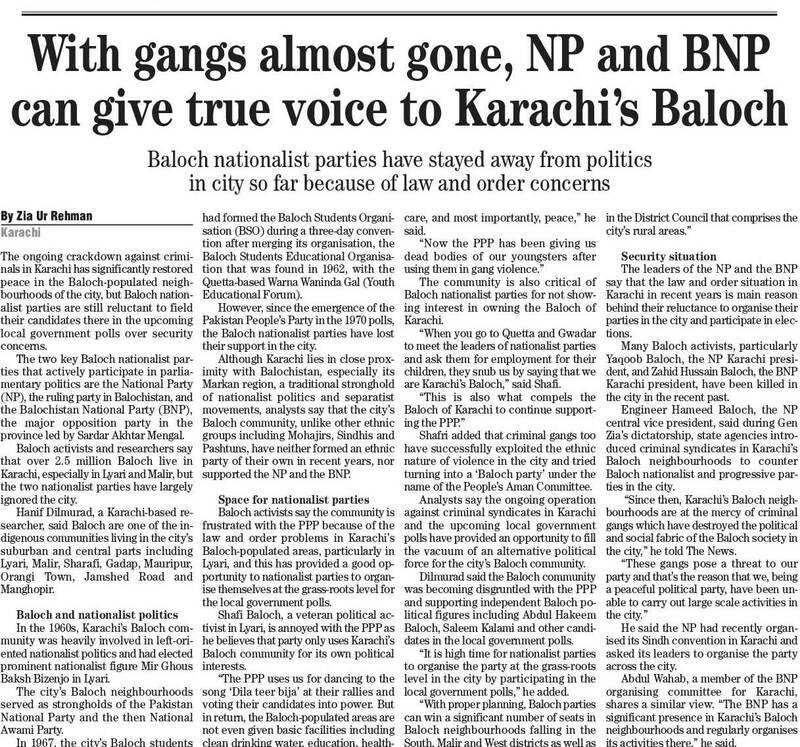 The leaders of the NP and the BNP say that the law and order situation in Karachi in recent years is main reason behind their reluctance to organise their parties in the city and participate in elections. Many Baloch activists, particularly Yaqoob Baloch, the NP Karachi president, and Zahid Hussain Baloch, the BNP Karachi president, have been killed in the city in the recent past. Engineer Hameed Baloch, the NP central vice president, said during Gen Zia’s dictatorship, state agencies introduced criminal syndicates in Karachi’s Baloch neighbourhoods to counter Baloch nationalist and progressive parties in the city. “Since then, Karachi’s Baloch neighbourhoods are at the mercy of criminal gangs which have destroyed the political and social fabric of the Baloch society in the city,” he told The News. He said the NP had recently organised its Sindh convention in Karachi and asked its leaders to organise the party across the city. Abdul Wahab, a member of the BNP organising committee for Karachi, shares a similar view. “The BNP has a significant presence in Karachi’s Baloch neighbourhoods and regularly organises its activities there,” he said.